I graduated from Lindenhurst High School in 1971. I know that most of you probably weren't even born yet; lol. This is my graduation photo. The Village of Lindenhurst is located on the south shore of Long Island in New York. I grew up across the street from the canal where the clam boats were lined up ready to take off early every morning. My Aunt Ruth (dad's sister) taught me how to twirl a baton as a kid. I tried out for cheerleading but didn't get chosen. Instead of being discouraged, I worked on my twirling. I even attended a summer camp on my own to improve my skills. I made the twirling team as a high school freshman. And in my junior year, I became the Captain of the Lindenhurst High School twirlers. I love Facebook as I've reconnected with so many of my Lindenhurst High School friends. After 39 years, we've all changed but it's such fun to share memories from those earlier years in our lives. I've been following a local blogger named Lylah Ledner of Simple Home Living and La Maison Et Le Jardin. 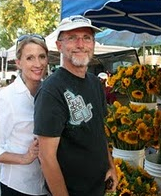 She writes about her Phoenix area Cactus Farm and loves all things French. BTW, if you've never visited her blogs ... you must. We've emailed each other about eventually getting together. And guess what? Through Facebook, I discovered that I went to high school with her husband Mike and his brother Bob! I was one year behind Mike and two years behind Bob. It really is becoming a small world after all! You are so beautiful and always have been! I cannot believe you graduated in 1971 you look far too young!!! I love your photographs, I tried to teach myself to twirl a baton with not too much success!!! So beautiful my friend. And just so you know, I was actually alive at that time! LOL! I've connected with some old friends on FB as well. I love it. Yep, I was born two years later hehehe. You look so good with that cheerleader outfit and the baton. I am now following you on facebook.. This was fun to read. It is most definitely a very small world! I've recently heard from a slew of friends from elementary school on fb and we've had fun laughing at old pictures. I remember 1971 : ) My sister graduated in 71 but I'm not too far behind. Sometimes I forget my age and I'm caught off guard when reading a blog and they say something about being born in the 80's. For some reason I always think of myself as being younger than I am. I guess that's good right? And truly, truly amazing to come across a blogger to find out you and her husband went to the same school!!! Love when that type of thing happens!!! I just sat on the floor recently pouring over old pictures, what fun! (and then stuffed them back after I lost all track of time) You were a doll then and you are a doll now! Keep em comin!!! p.s. I didn't carry a baton but I did carry a flag (flag girl), now am remembering the high stepping, what fun! Amazing beautiful pictures! Have a great weekend my dear Debbie. Hugs. What beautiful pictures!!!! Good for you for not giving up, and pursuing twirling!! And yes, very small world on Facebook. That's pretty awesome how you went to HS with her hubby and brother!! Thanks so much for coming over and for your encouraging words! I love your focus too, for health and making heart choices. And you are just as beautiful today! Maybe even more so! I'm telling you ... it's those Norwegian genes! I love these old pictures. I was telling my granddaughter about being a cheerleader, and our dresses were nearly to our knees, and we thought we looked great! I wonder if I even have a picture. Now you've inspired me to dig in some of those old boxes! LOVE, LOVE, LOVE these photos ... maybe because I was born prior to 1971 and because I also twirled a baton! You were, and are gorgeous. it really is amazing what happens to you as you blog away. You have had the neatest experiences, and what is so great, is they keep happening. What a blessing. Love looking at your pictures. You are so beautiful Debbie then and now! Love and hugs.